And there is a free excerpt in the link above as well. That said, I wanted to spend most of this post talking more broadly about this project. As is probably obvious, after taking a bit of a break to catch my breathe after the Gush book was published, I've been pushing forward to produce these chapters so that all 25 chapters will be done well before Magic's 25th anniversary. The goal is to compile them all into a wonderful book. With 2009 ready for launch very soon, and 2010 and 2011 also in the queue, I'm well on track. Since this project started almost 7 years ago, my thinking has shifted a bit in a number of respects. Most obviously, my thinking regarding the classification of schools has sharpened considerably. That's been reflected in the last few chapters, but especially the 2007 chapter. But this isn't just my narrative. Especially as I go back and begin to review and revise the chapters for the book (and re-write the introduction), it's important that I receive as much feedback as possible for accuracy. I have a running list of folks I need to interview that I haven't, but will (despite having done many interviews for this), and a number of items that need to be corrected, sources to be added, etc. But your feedback matters as well. 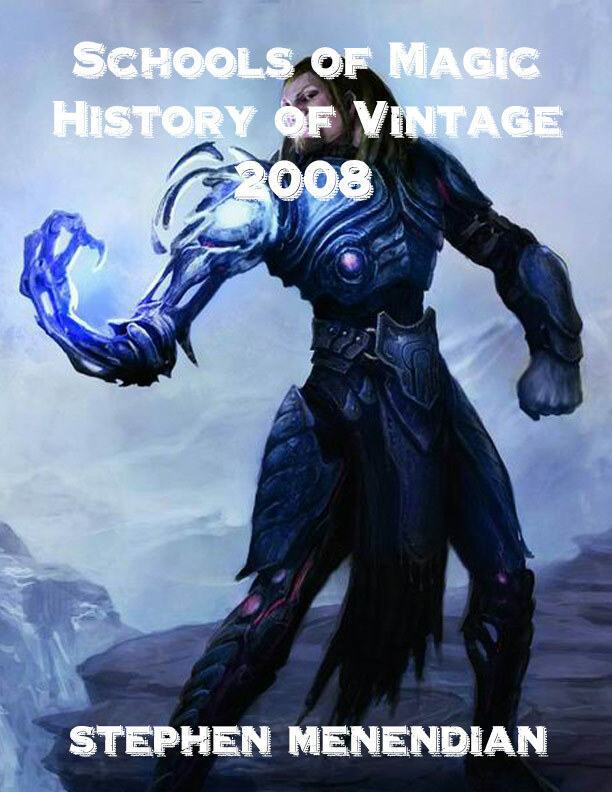 2008 was when I got back into Magic after having played on the sidewalk around 1997. It was when I first started getting competitive. My first competitive deck was a Standard Bant Exalted deck. When I experienced my first Standard rotation, I decided that Standard was a dumb game for babies. My second competitive deck was a ten-proxy Vintage deck - 5 Color Stax. I'm really excited to be caught up to the point in this series where I started living it! I'm sure this isn't a high priority and may not be feasible, but I would certainly be interested in some kind of "pre-order" option for the book that includes PDF versions of current and future chapters as they become available. I'm sold on the concept of the complete physical book, and would love to read chapters as they come out, but am not really motivated enough by the latter to pay twice for essentially the same content. @solemn_storm seconded. I'm actually several behind for this reason. That's not unreasonable. Some people are just interested in a specific year, and they should be free to get an article to see what this series is like. I can't really predict when the book will be ready. Even once the chapters are done (and 2012-17 are not yet written), there is a lot of work to do before it will be ready for publication as a book. When the book is available, there is a good chance we will take down the individual chapters. So if anyone is interested in a particular year, I'd encourage them to get that while they can.